I'll admit, I have a bit of a throw pillow problem. I love, love throw (or accent) pillows for any room. In an instant you can change the feel of a space with a quick change of accent pillows. They add texture, colour, pattern and comfort with minimal effort. Here are some tips on how to arrange your throw pillows with ease. From bedrooms to living rooms and outdoor spaces, follow these 5 simple steps and you'll be a pro. When choosing throw pillows for your spaces, the first thing to keep in mind is DON'T match the sofa or bedding. YES, to complementing your pieces and fabrics (see below), but NO need to be too matchy. Do you have a grey sofa? That's a great neutral to work with, but avoid using grey pillows. Grey + grey = yawn. That takes us to the next tip. Whether your pieces are neutral or vibrant, choose accent pillows that complement your space. Use them as a way to pull a room's look together. In a neutral room, throw pillows are a great way to add a pop of colour or pattern. In a vibrant or very modern room, throw pillows can soften the look with neutral colours and textures. Do you have a piece of artwork with a hint or yellow? Don't be afraid to complement it with a yellow accent pillow in your "pillowscape". If you have a colour scheme in mind, choose pillows that complement that palette without going overboard. A go-to design "rule" is to use odd numbers. The same goes for throw pillows. Use odd numbers in your spaces. Depending on your pieces, 3 pillows are better than 2 on a couch. 1 accent pillow is better than 2 on a bed. And, so on. Remember, less is more. If you have too many pieces, edit and take away to achieve a more natural, lived-in and effortless look with odd numbers. This is the most important and FUN tip. Don't be afraid to mix the colour, texture and patterns of your throw pillows. Create interest, depth and delight with a variety of accent pillows in your "pillowscape". Solid colours paired with different patterns and textures are a great way to show your style and personality in a space. Don't forget the simplicity and beauty of pillows with type like our new How Sweet It Is throw pillow (seen above), or the collection of accent pillows from Dayna Lee. This also applies to pillow size and shape. Throw pillows can have complementary shapes and sizes and still work well together. Fun accent pillows shaped as animals and letters are perfect for nurseries/kids rooms. My favourites are from Sun + Stars with sweet moons, trees and dinosaurs. I also love the Nordic style knotted pillows from Juju & Jake. They're versatile and make a statement on their own. See both below. Going back to the principle that less is more, be sure to leave room for real living. Your spaces should be inviting and ready to enjoy. Avoid filling your sofa, beds and seating areas with so many throw pillows you can't sit down. If it looks like too much, it probably is. Feel free to edit and avoid having your pillows literally "thrown" on the floor! Gasp. I'm guilty of this. Use bolsters for arm chairs which allow people to sit in comfort. Use one accent pillow on a bed as a focal point with complementary pillow shams (instead of more throw pillows). If you have multiple pillows on a couch, layer them to save space. When buying inserts for your throw pillow covers, size up to achieve a full look (no sagging). For example, if your pillow is 18" x 18", get an insert that is 20" x 20". Don't worry, it will fit. New inserts are easy to find at home decor stores and big box stores like IKEA. Better yet, if you have an old throw pillow or one of those matchy pillows that came with the couch that's the right size, re-use it and stuff it in your new pillow cover. It will save you time and money, plus it's wise to re-use. That’s it! Five easy steps to styling pillows. Thanks for reading and enjoy! Nothing is more welcoming than walking into a space with a great gallery wall. It pulls a room together by nodding to the design elements of the space by pulling a theme or colour scheme together. Plus, a gallery wall undeniably makes a statement. A personal statement of style. We've partnered up with Julie Taylor, Interior Decorator & Style Maker, to guide you through the elusive (but oh-so simple) task of creating a winning gallery wall. Julie creates welcoming, thoughtful and stylish residential spaces. She combines her love of interior design, with a background in fine art to bring an innate sense of balance and harmony into her work. Let's get that gallery on the wall! Trust us, it's not as difficult as you might think. Just follow these tips. First, here's what you'll need. Your collection of framed artwork and objects. Hardware for hanging artwork. May vary depending on the size and weight of your pieces. Gallery wall styling by Julie Taylor Interiors. Photography by Swell Made Co. The first step is probably the hardest step. Choosing what you want to display on your gallery wall. In a previous post, Becky Freeman and I talked about How To Curate Art with Heart which helps you choose meaningful pieces for your space. There are still some things to consider before creating a gallery wall. When choosing your pieces consider size (various or the same), the style of frame (various for more eclectic, or the same for a more cohesive look) and the number of pieces. It's nice to have an odd number of pieces, but if an even number happens to flow, that's okay. Vary the style of works for a more dynamic look. Realism and abstract. Geometric and soft organic shapes. There should be a common element tying them together (colour is easiest, as mentioned below). Too many similar pieces will create competition. Variation allows each piece to shine. One final thing to consider is the theme or colour scheme of the pieces. Try to tie in one element for consistency. Is there a consistent colour throughout? Maybe a consistent theme of beaches you love. Colours and themes will easily help create a cohesive gallery wall, but it's not necessary. When in doubt - keep it simple. It's a balancing act, but it will work in the end. Once you've curated and framed your artwork, it's time to develop a composition for your gallery wall. Clear a space on the floor that equals the space on the wall (not too big, not too small) and start piecing together a layout. Again, you have a choice to mix it up and create a more random look. Or, you can space things out equally to create a grid which works well when the frames are the same size/style. Anchor your favourite or largest piece in the centre, and gradually work in other pieces around it/them. Keep a few inches between the pieces as you hang them, and try to keep that consistent throughout. Play with it until it feels right. It's all about creating a sense of balance. Don't stress! Just follow some simple guidelines, your intuition and some inspiration. There are no real guidelines or rules when creating a gallery wall. Handy Tip: Photograph the arrangement while it's on the floor to give a different perspective during the process. Plus, you'll remember where everything goes! It's time to start working on the wall. Consider the gallery's proximity to the ceiling, furniture, other walls and objects (not too close!). Also consider where the focal point will be. Once your layout/composition feels right, cut out pieces of kraft paper to match the size of your pieces. A roll of kraft paper is perfect since you'll likely need a lot. Now, you can use washi or painter's tape to adhere them to the wall. Mimic the composition you created on the floor and feel free to move things around until it looks right. Don't forget to step back every now and then. Finally, it's time to commit your pieces to the wall with hammer and hardware. Using your pieces of artwork as a guide for where to hang is the most accurate way. Place the artwork over it's matching piece of kraft paper to see where the hardware will sit. Use your hand or a pen to mark on the paper. Hammer your hardware in place of your mark and simply remove the kraft paper and tape from the wall. Hang your piece! Keep doing this until the gallery wall in complete. If you need to adjust slightly during this process, it's okay. Take a final step back, breathe, and enjoy your gallery wall. Feel free to add or take away pieces as time goes on, keeping the artwork relevant to your life. Have fun and enjoy! For some inspiration, here is a round-up of our favourite gallery walls on Pinterest. Click on the images for links. Thanks for reading and good luck with your gallery wall. A gallery wall is the perfect way to proudly display your story, and your style. Don't just hang anything though. Curate a collection of art with heart. Collect things that are meaningful, and you'll never grow tired of your gallery wall. It will be a conversation piece and a comforting mantle in your home. Swell Made Co. has partnered up with Becky Freeman, Interior Designer & Stylist, to guide you through curating an art collection. Becky knows how and where to find the perfect elements for any project. With a decade of professional interior design experience (including Gluckstein Design), Becky has refined the process of creating a successful space. The first of our collaborative posts, we're excited to share these tips. Next, we'll share How To Create a Gallery Wall. Read on for simple, but thoughtful things to keep in mind while curating your own personal gallery wall or art collection. An easy choice to make things personal is to crop and enlarge your favourite photos. They can be photos of your family (old or new) or from your travels and favourite places. Perhaps, you've dabbled with photography and you have some abstract pieces to showcase. Art photography is available for purchase as well. Just check out minted.com for pieces like the one above. Paris anyone? Creating a grid based gallery wall with simple Instagram photos is an easy way to create a meaningful collection. You can print a batch of photos quickly and reasonably using an app like Parabo Press. OUI OUI by Swell Made Co.
Do you have a favourite song, book, quote, or poem? Frame the printed word. Letters are beautiful in the form of actual pages from a book, or typographical artwork featuring your lyrics or quotes. Swell Made Co. is a great example of typographic artwork that elevates meaningful (and witty) words. Choose what "speaks" to you. Keeping with a subtle French theme for this example, we chose OUI OUI by Swell Made Co. Your collection can have some unexpected dimensional elements as well. Perhaps a hat, a souvenir or something sculptural like the ones seen above by Umbra. Depending on what it is, you can either hang it directly on the wall or frame it. 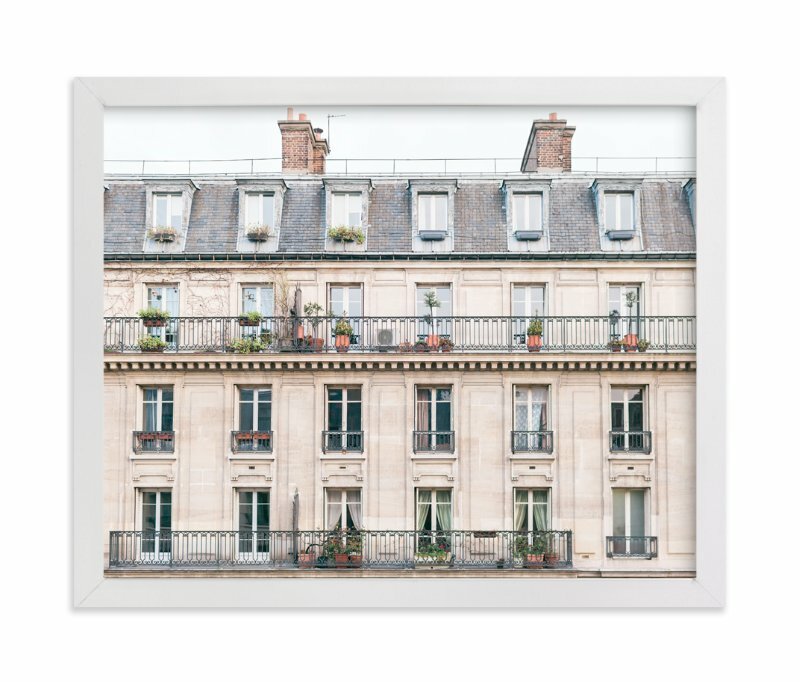 Make the mundane extraordinary, simply by framing it. Do you have a sentimental plate or record? Frame it! Do you have a collection of shells from your family beach vacation? Mount a few in a simple grid layout and frame them. Unexpected things can also introduce colour or texture. Does your decor call for a pop of neon, sleek gold or natural wood? Go for it. Memories transport us back to places we have travelled. Keep those moments close with photos and unexpected things as mentioned in tips 1 and 3. This can also come in the form of original artwork from exotic or local places. Been too many place to count? Frame a beautiful map to remind you of places you've been or lived over the years. It's fun to pick up small pieces of artwork when visiting a new country. Large pieces are great too, but small pieces pack easily. More importantly, they are easier to integrate into an existing gallery wall or collection. Just like the medallion above, Jon I Lit from Iceland. Original artwork by artists you admire, talented friends, or your own children is lovely to work into a space. Maybe you have some of your own. Keep it simple and basic. It doesn't have to be a renaissance masterpiece. Simple line drawings and abstract colour studies are perfect. Framing will only elevate these pieces. The beautiful artwork seen above can be purchased and framed at minted.com. Finally, fill in the gaps. If you're incorporating a theme (Feminine French) or colour scheme (Pink Hues), this is the perfect opportunity to round out the collection. Don't go overboard with themes and colours though - keep it simple. Perhaps you have a lot of dark pieces. Lighten it up with something with a softer tone, or an object with a delicate structure. If you're seeing a consistent hue in your collection, add something subtle in that same or complementary hue. Now that you've collected your artwork the next step is to choose frames. I have a great guide on how to frame artwork, right here! Next, we'll be posting How To Create a Gallery Wall. Watch soon for great tips so you can get your collection on the wall. Enjoy and good luck curating your collection! Framing an art print can be as easy as 1-2-3. A guide by Swell Made Co. So, you've purchased an art print. It will become a meaningful part of your home or office. But first, you need to frame it. Why? To protect that investment you’ve just made and to display it proudly. If you’re so inclined, head to a custom frame shop and leave it to the pros (like Creartive Custom Framing in Toronto). If not, framing doesn’t have to cost fortune. Here’s a quick guide to doing it yourself (or with a little help). Simple is Best - Choose a simple and neutral frame to allow your art print to be the focal point. Clean lines and finishes are best, and black or white are perfect neutrals. They are timeless, coordinate with any decor, and work well when creating a gallery wall or pairing art prints. Size Up - Your frame should be larger than your art print to create visual impact and a focal point. This includes the mat. Use a Mat - Pre-made frames often come with pre-cut mats. If you’re using the pre-cut mat, make sure it is the proper size for your art print (the window should be the same size, or 1/4 in. smaller for a slight overlap). If the pre-cut mat doesn’t fit your art print, you can have one custom cut by a frame shop or art supply shop. Just give them the dimensions of your art print and frame, and they’ll be able to help. Use the guide below. Mats typically come with 2-4 in. around the art print with a little extra on the bottom to provide weight and composition. You can choose any size or orientation you like, just be sure your frame can accommodate the mat. The larger the mat, the more dramatic and larger the frame. Shop Around - Good quality, pre-made frames aren’t hard to find. Visit retailers like CB2, West Elm, IKEA, art supply shops (Michael’s/DeSerres), Indigo, or HomeSense (in Canada). You can even do it all online with custom frame supplier Simply Framed. Framing an art print. A guide by Swell Made Co. Determine the size of your art print. When in doubt, measure it. Choose a frame size. Remember to size up from your art print. Determine the mat size. The window should be the same size or 1/4 in. smaller than your art print (no more, you just want a slight overlap). If the pre-made mat doesn’t fit, get one that is custom cut. Each Swell Made Co. art print will now come with a framing guide! That way, you can frame your art print with ease and get it up on the wall quickly. Click here to download the guide. Enjoy!